AMSTERDAM — In 2010, Latif Mukasa, an artist and *** rights activist from Uganda, was forced into hiding after his name and photograph were printed in a newspaper’s list of “Uganda’s 100 Top Homos” with the words “Hang Them.” When the police issued a warrant for his arrest, he escaped. He managed to make his way to the Netherlands, where he was offered asylum-seeker housing — in a former prison complex. It was not ideal, but he was happy to be safe. 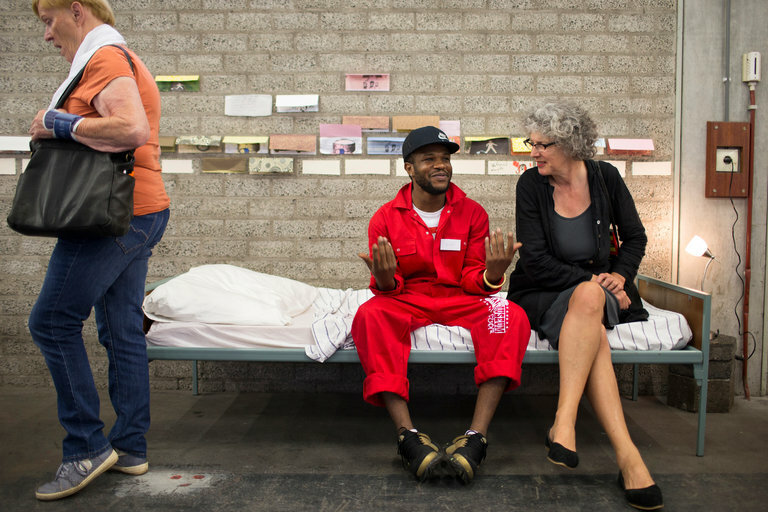 Last week, Mr. Mukasa, 33, who is both an artist and a refugee, was guiding a group of visitors through the Temporary Museum, a pop-up exhibition inside the Bijlmerbajes in Amsterdam, another former prison that is now a center for asylum seekers, and where those who fled are presenting works that help the public understand their migrant experience. The Temporary Museum, which opened on June 28 and will remain inside the building until Jan. 1, aims to present new perspectives on migrants, an effort to break the isolation that newcomers often feel. Mr. Mukasa stopped in front of his own painting, “The Gods of Africa,” (2017) depicting a large clownesque figure hovering over a small group of stick figures, painted in hues of green. His work is one of a half dozen that are part of the installation “APKAR (Artist Previously Known as Refugee)” from 2017, all made by former refugees and curated by the local Dutch artist Maze de Boer.